Natick is one of those rare communities that offers both rural beauty and an energetic, upscale urban feel. If you’re like most of us, though, your schedule is already fast-paced enough. So why not make your life a little easier by choosing a family dentist in Natick to treat you and your loved ones? Not only can this save you time and money, it could help you to enjoy better care as well. Here’s why. In the past, making a weekly shopping trip meant running back and forth to multiple merchants. Families bought their meat from the butcher shop, their vegetables from the greengrocer, their bread from the bakery, their apparel from the clothier, and their tools from the hardware store. Not only was this time-consuming, it could cause added expense and inconvenience if the shopper needed a hard-to-find item. Those days are gone forever. Nowadays, buyers have a wealth of shopping options at their fingertips. Many merchandisers carry multiple types of goods under one roof or at the same website. Most people agree that the modern approach saves them time and money. Trusting one dental office to care for your entire family offers similar benefits. There’s no need to dash all over town, rack up extra miles on your vehicle, or worry about conflicting record systems. Just schedule your appointments with a single practice and let skilled professionals do the rest. It’s easy and efficient. What more could you ask for? Better overall care. Dentists who limit themselves to only one type of patient may lack the expertise needed to deal with a wide range of conditions. On the other hand, family dentists see it all, from baby teeth to broken dentures. Such broad-based experience enables them to hone their skills and offer the utmost in quality treatment. Prevention of serious problems. Kids inherit lots of things from their parents, including dental problems. A professional who’s familiar with your oral health profile will be better able to spot warning signs in your children early on. The chance to set a positive example. Let’s face it, some kids hate going to the dentist. They find the experience unpleasant and even a bit intimidating. But, when your entire family uses the same clinic, you set a positive example for your children, helping them to form good lifelong tooth care habits. Warm familiarity and ongoing satisfaction. Using the same clinic enables you to build relationships with the staff. Those who know you by name, and who understand your family’s unique needs, can provide better service than those who are like virtual strangers. This makes for a more positive, enjoyable experience. 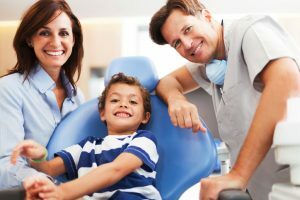 Add up all the advantages, and it’s easy to see why an adult and children’s dentist in Natick is the best choice for most families. You’ll enjoy better care and have more time left over for other things. Those are the kind of real-world benefits that can make every facet of your life less stressful and more rewarding. Dr. Papageorgiou leads a team of caring healthcare professionals who use only the latest tools and techniques in caring for their valued patients. You can reach the office through its website or by calling (508) 545-1126.